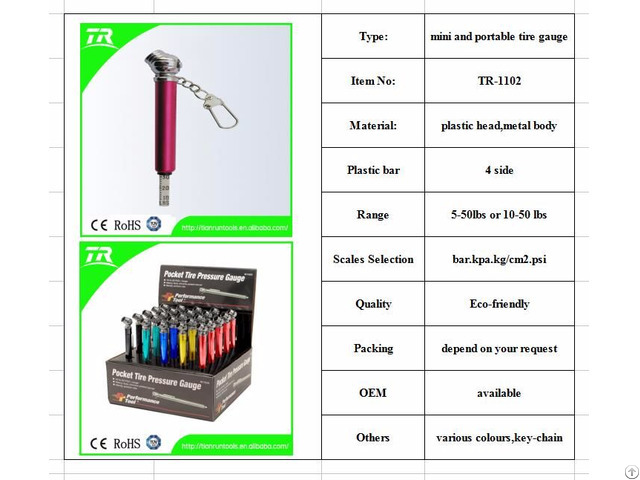 mini portable type tire gauge/0-50 psi/pressure unit:bar, kpa, kg/cm2, psi/plastic head and metal body with keychain/4 side plastic bar/we are from TR tools, specialized in various kinds of tire gauges, we have perfect quality and competitive price, we want to build a good long term relationship with you to get a double-win, any news pls send email or browse our website by below address, tks! Business Description: Zhangjiagang city tianrun auto accessories co.,ltd is a professional company in auto accessories . The company is located at zhangjiagang city. 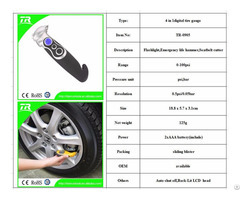 After our efforts, We has gained adequate experiences in the auto accessories product. Our products sell very well and enjoy good reputation both in domestic and overseas market . Our product is Electric winch ; Tire gauge ; tire repair tools ; emergency tool set ; hoist & cable puller and so on . We also has the experience do the garage decorate product examples as the car model & neon light & bar stool and so on . So we are committed to the car culture and the product . So we believe you are right to choose us .